This is the easiest possible way to add Galleria to a single post. We used WordPress 3.5.1, but the process should be fairly similar in earlier versions. The default WordPress media settings are not optimal for Galleria. The medium size images are a bit too small at 300px, and the large size images, at 1024px, are a bit bigger than our recommendation. If you choose to keep these settings, adding your images as “medium” will give you a faster, more responsive Galleria, but it will suffer visually. If you add your images as “large”, it will look great, but it will probably feel a bit sluggish, especially as the amount of images grows. If you are in a position where you can change these settings without impairing the rest of your site, we suggest you set the max width/height of your large images to 800px. If you are not sure, do not change the settings. It’s entirely possible for a WordPress theme designer to edit these settings, and your theme might depend on them to not break. If you have already changed these settings to suit your other needs, find the image size that is closest to 800px. Note: If you are using Galleria with a theme that supports fullscreen, Galleria will automatically use the original file for full screen mode if you use the correct settings when adding the image. More on that below. If you are using this method with our free theme, you don't need to change anything in the script. You can safely skip to the next step, 3. Create the post. Log in to your account at galleria.io/customer. Find your theme file in your Purchase History. Click the "Download" button next to it. Save and unzip the file. Start your FTP application, connect to your WordPress host, and browse to the wp-content folder. The zip file should contain a folder named after your theme. 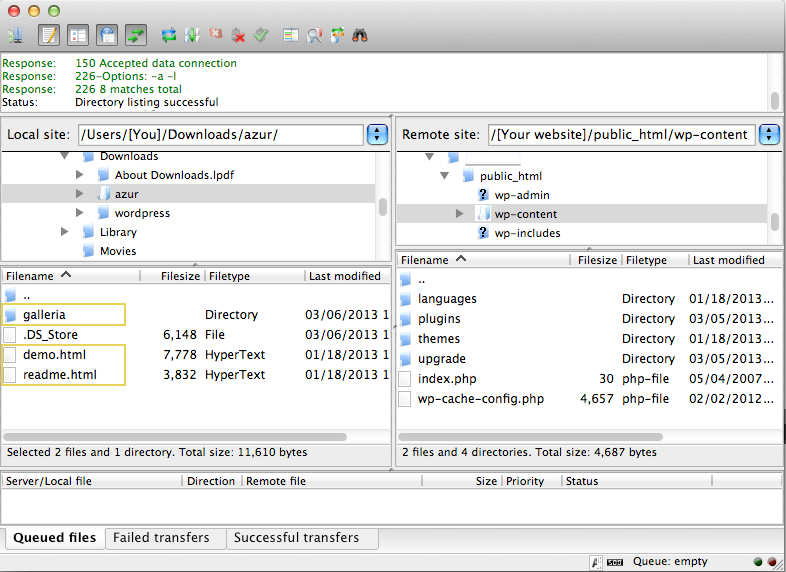 In it you will find one folder, galleria, and two files, readme.html and demo.html. Upload these three to the wp_content folder. If you see a file named .DS_Store, ignore it. 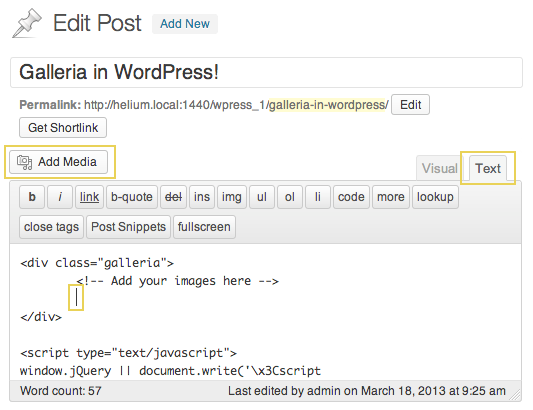 To try out your Galleria installation, go to www.yourwpdomain.com/wp-content/demo.html. If it doesn’t work, make sure the path is correct. If you found your wp-content folder at /public_html/wp/wp-content, change your url accordingly: www.yourdomain.com/wp/wp-content/demo.html. If that doesn’t work either, go to Settings > General and find the field “WordPress Address (URL)". Copy that and paste it in your browser address bar, then add /wp-content/demo.html to the end of it. If you’re still out of luck, please use our priority support. Once you have established that Galleria works as expected, you can safely remove the readme.html and demo.html files to avoid cluttering your wp-content folder. If you're not used to working through FTP, steps 4 and 5 might have thrown you off. Don't worry, it's not very hard. Start by checking the support section of your hosting company web site, they probably have a guide on how to set up an FTP application and use it. Create a new post, a new page or a new custom post and enter the “Text” (formerly "HTML") edit mode as opposed to the “Visual” mode. You do this by clicking the appropriate tab on top of the editor, far right. * but don't forget the comma at the end. Click the “Add media” button. Add a title and/or an alt text. Galleria will display both of these in the info box, with the title as header and the alt text as body. Select “Media File” in the drop-down named "Link To". 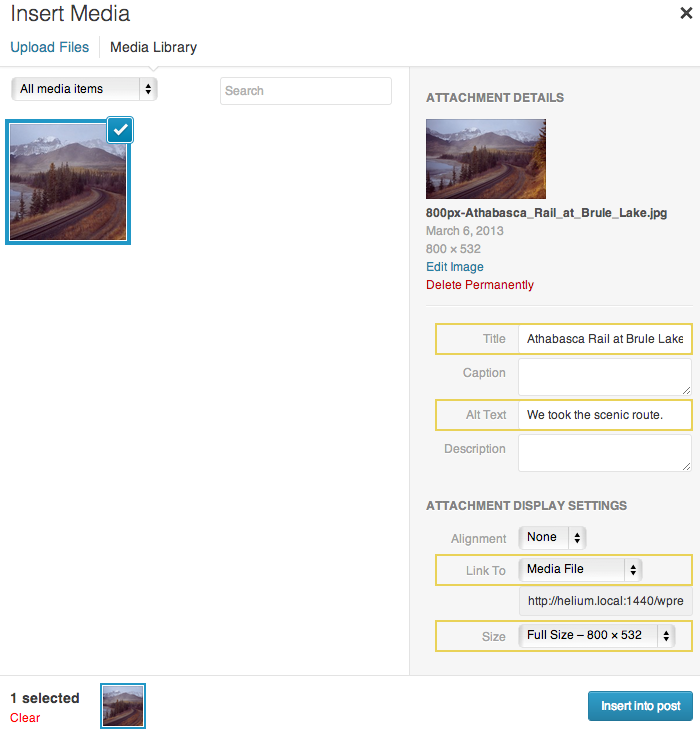 This way, Galleria can find the original images if your theme supports fullscreen. In the drop-down named "Size", select an image size as discussed in 1. Check your media settings_. Recommended settings depend on the orientation of your image. For a landscape image, find the size with a width close to 800px. For a portrait image, the height can be anything between 400px and 800px and it will look nice. If you don’t want to use the CDN for the core Galleria file, you can change that line accordingly. Note: The paths to the script files are relative to your domain. That means, if the address to your WordPress site is http://mywebsite.com/blog/, then the path to the scripts should be /blog/wp-content/galleria/. It's time to preview your post. If you have followed the above instructions, you should see an instance of Galleria when you click the "Preview" button. If not, check out the Troubleshooting_ guide below. The above script is all you need to turn your post into an amazing image gallery, and a good starting point. But if you’re feeling adventurous once you get it working, there are tons of options you can use to customize your Galleria. The Galleria Docs has a whole section of standard options that you can use for all themes. You can find it here. There are also theme specific options for localization and feature toggling. Find your theme in this list. If you are experiencing strange behavior or fail to see the Galleria at all, here’s a few pointers. These only apply to the above method of adding Galleria to WordPress. For general Galleria errors, check out the Galleria docs on errors. When all else fails. You might be using an incompatible jQuery version. Our script checks if jQuery is loaded, and only loads version 1.9.1 from the Google CDN if it isn’t. If you are using an extremely old WordPress theme, and that theme uses jQuery, there is a chance that it’s using a version that’s not compatible with Galleria. Honestly, we don’t know what version that could be, and we couldn’t reproduce this problem, but it’s possible.